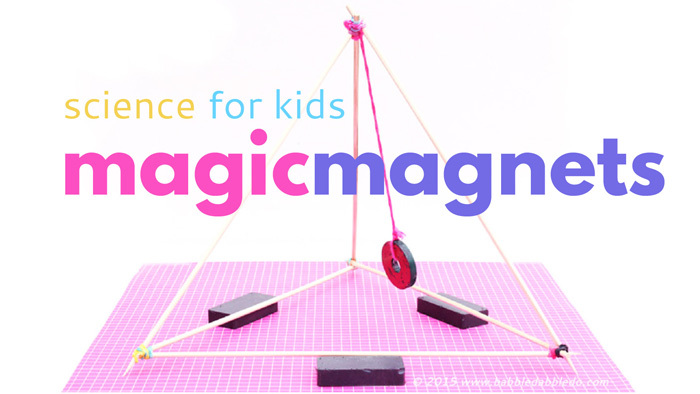 This super simple set up yields 4 easy magnet experiments that kids will absolutely love! And it just so happens these project are a great tie into Valentine’s Day though honestly they are fun any time of year! So what does magnet science have to do with Valentine’s Day? Well…. This project was originally part of the sensory series Playful Hearts: Valentine’s Inspired Play & Learning. For more projects in the series scroll to the end of the post. Have you ever noticed that some of the common sayings people use to describe love and attraction are based on the scientific phenomenon of magnetism? Here are some examples: They had a magnetic attraction. He exudes animal magnetism. They are polar opposites. I was drawn to her. She has a magnetic personality. It makes sense that love and magnetism are synonymous. Love is that indescribable feeling you get with certain people that makes you feel all warm and gushy. In the case of romantic love perhaps it makes your heart race, your palms sweat and you can’t help but feel its strong force. Magnets have a similar effect. Magnets are objects that exude a strong force field around them that causes them to attract ferromagnetic materials and other magnets themselves. Strong magnets are drawn immediately together when placed in close proximity. And did I mention that this magnetic field is invisible, just like love? You can’t see it but you can certain feel it, and it’s a fun sensory experience for kids to try and “touch” an invisible force. 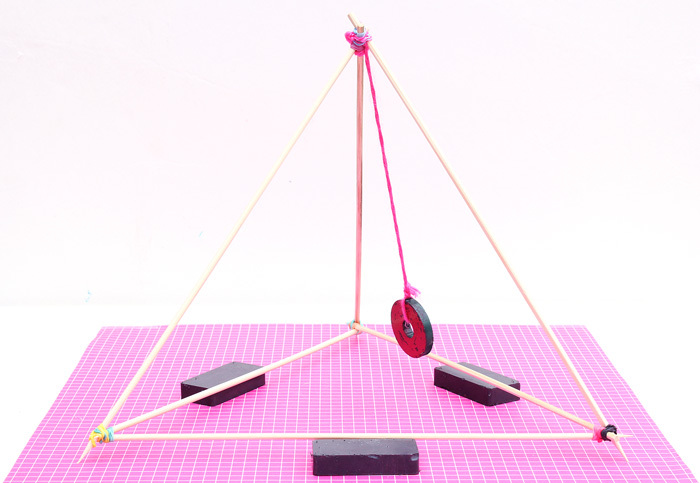 For our post today we made a simple pyramid structure that will give you the chance to explore the invisible and strong attractive force called magnetism. One of the ways we have fine tuned this project over the years is to substitute modeling clay for the loom bands. It’s MUCH easier for kids to put together on their own. We also made our own wands with a pencil and ceramic disc magnet hot glued to the end. 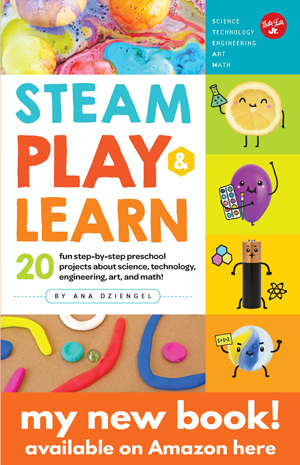 Small rubber bands (loom bands ) OR Substitute modeling clay or play dough! Step One Cut a piece of string about 8” long and thread through a donut magnet. Tie tightly. 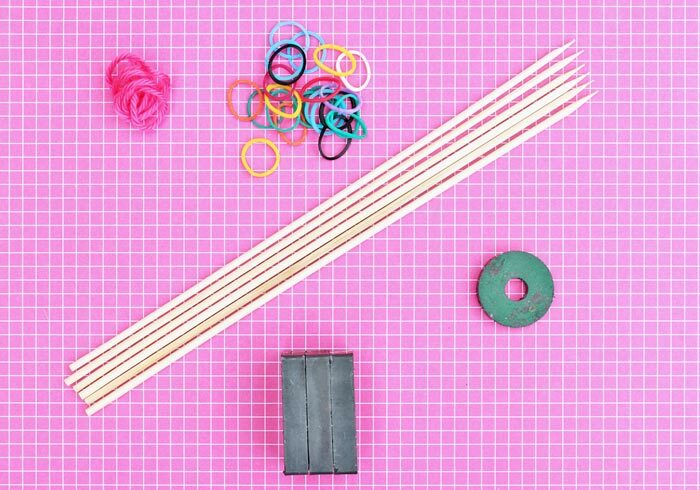 Step Two Connect the ends of two skewers by overlapping them and wrapping a loom band around the joint. Step Three Repeat Step Two to connect a third skewer and form a triangle base. Step Five Add your last skewer to complete the pyramid shape. Wrap the joint tightly with a loom band. Give each child (2) strips of modeling clay. 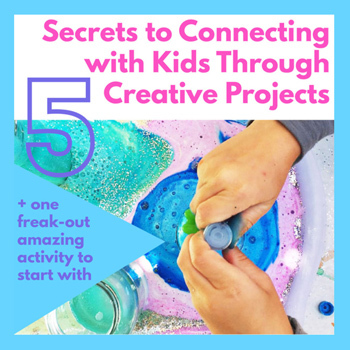 Ask them to tear each strip in half and the roll the halves in a clay sphere. They will need (4) spheres in total. 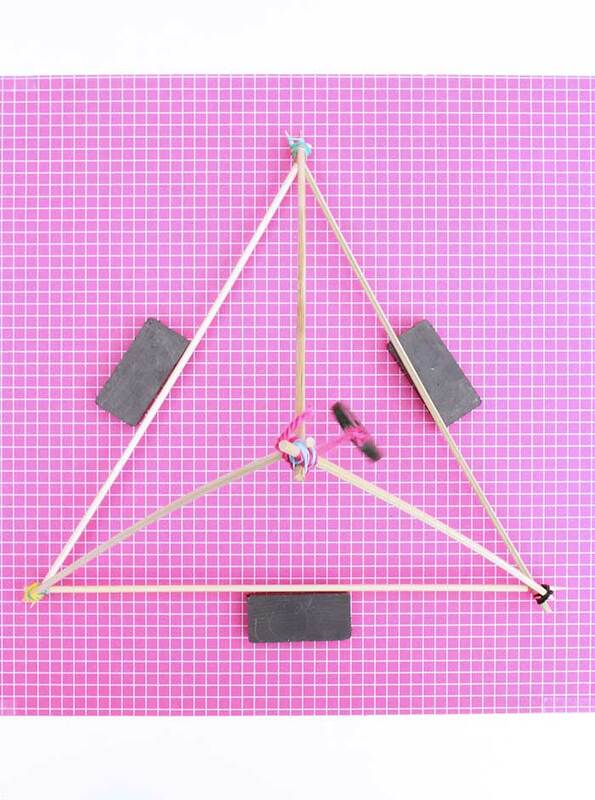 Construct the triangular base with a clay sphere at each joint. Once the base is complete, add a skewer to the top of each sphere and collect at the center point to form a pyramid. Use the last clay sphere to connect the top three skewers. The magnet on a string may be pressed into the top clay sphere to hold in place at the desired height. 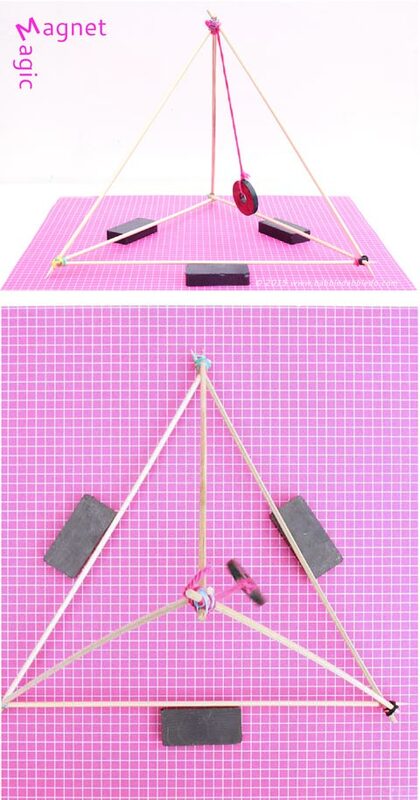 This little DIY pyramid structure can be used to make several different observations about magnets. I loosely divided them into 4 mini experiments you can first watch in this video and then read about below. Can you move something without even touching it? Magnetic force is very strong when magnets are placed in close proximity to each other. To see just how strong it is try this: Take two rectangular magnets and place them under the center point of the hanging donut magnet. Gently slide the rectangular magnets around and watch as your donut magnet follows the magnetic force. Twists and turn the donut magnet by twisting and turning the rectangular magnets beneath. 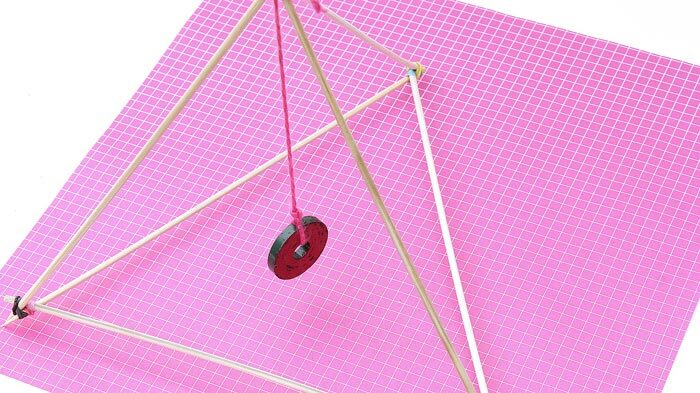 Seemingly defy gravity by suspending your donut magnet at an angle! Magnets have a north and a south pole. This means that one end of a magnet attracts and the other side repels if placed next to another magnet. This is a fun observation to make with magnets of any kind. To see how this repelling and attracting can drive a magnet crazy try this: Place one ceramic magnet under the center point of each bottom chord of your triangle base. Now gently lift your donut magnet and let it swing. It will bounce back and forth between the three magnets’ fields as it encounters the different polarities. It will look like a wildly indecisive magnet that has no idea where to go! Move the rectangular magnets around to see what happens to the center magnet and how it swings based on its proximity to the different magnetic fields. This is my favorite experiment. Let the donut magnet rest as still as possible at the center of the pyramid. Now take a magnetic wand (or a strong magnet) and begin gently waving it near the donut magnet (don’t get too close or the magnets will stick together). Watch as the donut magnet begins to sway and twirl. You can really make that donut magnet shake it’s groove thing simply by moving your wand nearby! Because our donut magnet is suspended by a string it amplifies the twirling action. And for any doubters who think that the slight breeze generated by waving your hands is causing the magnet to dance, try waving your hand nearby without the wand. The donut stays put. Place two rectangular magnets underneath the donut magnet. Gently pull on the donut magnet to release it from the magnetic field then let it drop and swing over the rectangular magnets. It will quickly be caught right back in the magnetic field and move quickly back and forth in a jitterbug dance. Leon Theremin. How many of you know and are fascinated by the musical instrument known as the Theremin? If you don’t know what I am talking about please go watch this video RIGHT NOW of the most well know Theremin performer Clara Rockmore. The Theremin is the only musical instrument that is played without physical contact. It was invented in the 1920s by Leon Theremin and is based on the phenomenon that interrupting an electromagnetic field can produce audible frequency changes. Essentially the Theremin has two antennae that broadcast a signal to each other and when you wave your hands between the antennae you interrupt the magnet field between them causing the signal to change. Here is a great little video demonstrating it. Leon Theremin was a Russian scientist who discovered this phenomenon when working on proximity sensors for the Russian government. He went on to patent this electronic musical instrument and it’s eerie sound can be found in many a sci-fi movie soundtrack from the 1950’s. Though it became associated with campy film soundtracks in the 1950’s it was actually used in some classic films like Spellbound and The Lost Weekend and is most famous in popular music in the song Good Vibrations from the Beach Boys. 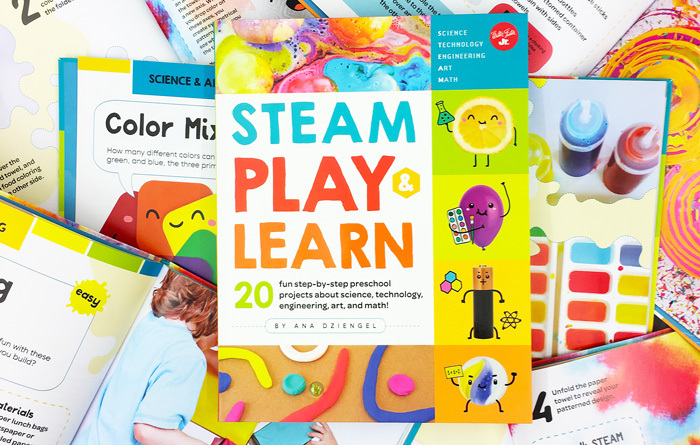 Magnets are one of my favorite materials to work with and these easy magnet experiments are simple to set up and kids love to watch them in action! Magnetic attraction is seemingly magical and I haven’t met someone yet who isn’t momentarily mesmerized by it’s power and behavior, just like love. Ready for more Valentines Inspired sensory fun? 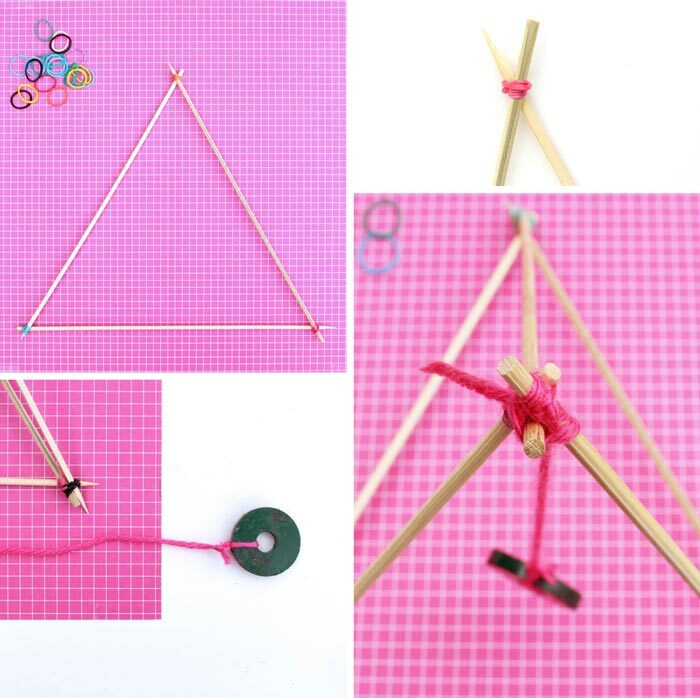 The impossibly sweet Hanging Hearts Creative Threading Activity from Childhood 101. A smart Valentine’s Math Station from NutureStore. That video is AWESOME Ana!!!! !Cant wait to share it! That’s cool i am going to do that for the science fair! Awesome! I love the magnets and love tie-in. And the video is amazing! It brings the whole thing to life and makes me want to run home and set this up. I *think* we have the magnets and skewers, but this is totally worth a trip to the store. I would like to do the same magnetic experiment with my little students. But, I failed. Would you mind give me some hints? Or advice me the dimension of the rectangular magnet and donut magnet? I work for a hands-on exploring museum in MN, and I was scrambling for an alternative project. The one I had planned on using just wasn’t as fun, easy or amazing as I had hoped. Then I found your post! We already had all the materials on hand, so I jumped in and had a camp full of kids try this. I was a little anxious, since a lot of the campers were upper elementary aged, and I worried they might be “too old” for a magnet game. 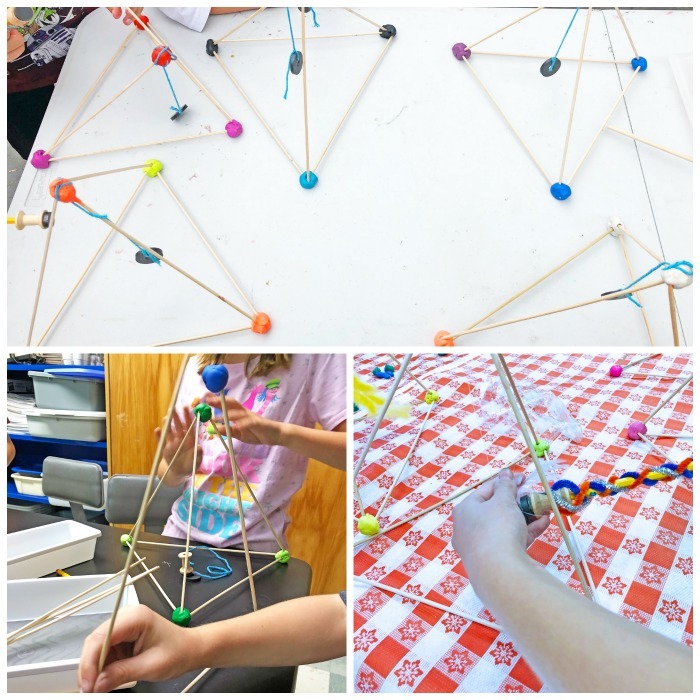 I let each camper choose if they would make the pyramid out skewers (like your example), regular plastic straws (colorful of course!) or giant bubble-tea straws. Then each figured out how to hang their magnet from the peak using string, and how they would like to attach or control the side magnets. 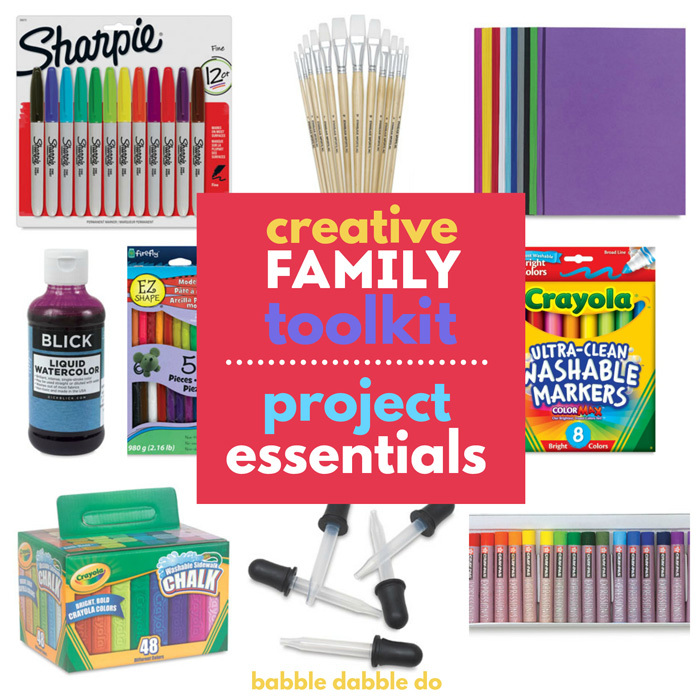 Thanks so much for sharing this fabulous idea! I love your blog and suggest it to everyone who asks for ideas. You are the BEST! I’m surely gonna chose this as my science experiment. It’s really good!